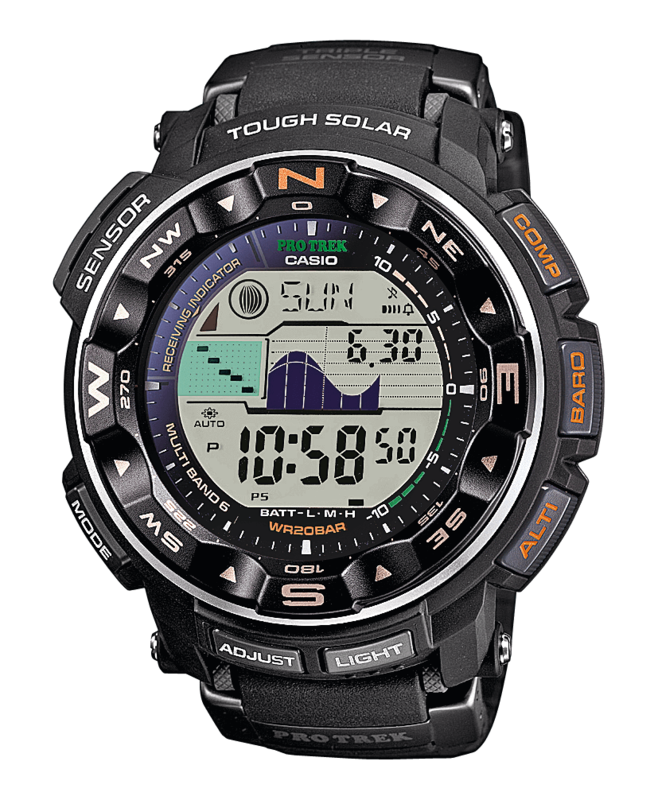 All features useful for expeditions to this or other peaks, combined: in addition to the digital compass, barometer, altimeter and temperature measurement, the watch also scores points with its Multi-Band 6 radio technology and solar operation. 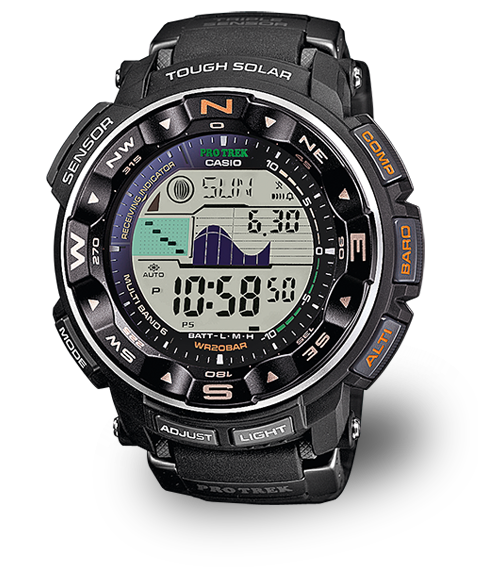 For fans of water sports, this model is equipped with a tide indicator and water resistance up to 20 bar. Automatically deactivates the Auto EL backlight function when surrounding light is sufficient, and activates it under dim light or dark conditions. Even temperatures as low as -10 °C have no effect on this watch. A solar cell provides power for operation. 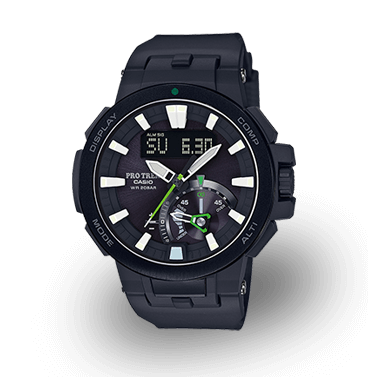 Whether in Europe, North America and Japan or in the outer reaches of Canada, Central America and China - once the watch has been set to the local time, it receives the relevant signal and shows the correct time wherever you are. In many countries, it also sets itself automatically to summer and winter time. Giving you a constant overview: Elements on the display are distinguished from one another using colour. This is achieved using different coloured layers placed on top of one another, allowing information to be displayed more clearly. A built-in direction sensor detecs the magnetic north. A pressure sensor detects changes in the air pressure and converts the result into an altitude up to 10,000 m.
The height gain sums all the meters you have climbed in a session, so that you can see at a glance the total ascent on a tour. 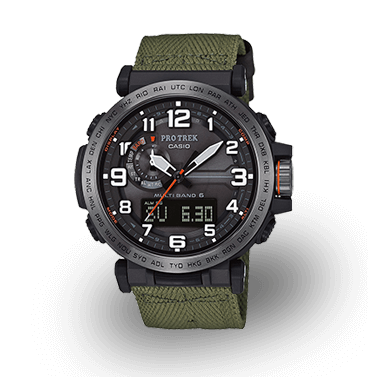 Depending on the model, up to 40 sets of elevation data can be stored in the watch's data memory and re-accessed at any time. Each of these data sets consists of a measured altitude as well as the date and time. In addition to the individual altitudes, the maximum and minimum altitudes during a measurement are also stored. A special sensor measures the air pressure (measuring range: 260/1100 hPa) and presents this on the display in the form of a symbol. This enables early detection of weather trends. 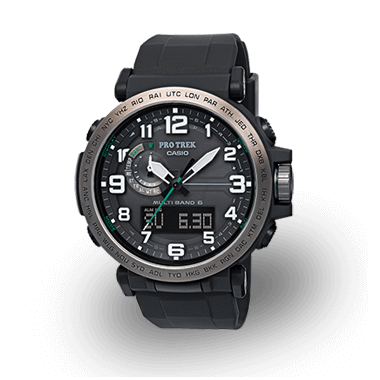 A sensor measures the ambient temperature around the watch and displays it in °C (-10°C /+60°C). Once the high tide time has been entered for a selected location, the watch can display the low and high tide phases at this location on any given date. This can be quite useful, for example, if you want to know the patterns of the tides at your destination in advance. For fans of precision: the countdown timers help you to remember specific or recurring events by giving off an audible signal at a preset time. The time can be set to the nearest minute and up to 1 hour in advance. The perfect prerequisite to every regatta and yacht race: The countdown start time can be set within a period of 1 to 10 minutes, usually 5 minutes. An audible signal sounds once after every elapsed minute. For the last ten seconds before the start, the signal sounds every second. The button tones for using the mode button can be turned off. This means that the watch no longer beeps when switching from one function to another. Preset alarm or countdown timers remain active when the button tones are deactivated. This bezel can be used to determine approximate directions. An indicator shows the current battery level. 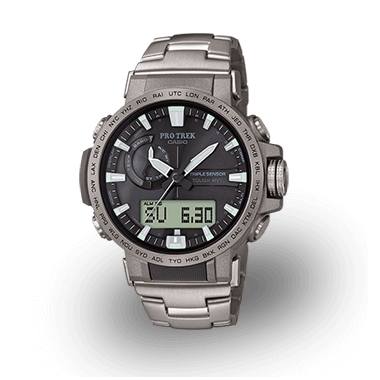 Find out more about the PRO TREK function highlights on the "Technology" page.